Unfortunately, violence is a part of our world but there are ways we can prepare for it. Relatively inexpensive, portable, and effective, pepper spray is an easy way to ward off attackers. No prior experience is needed and it’s easy to keep discreet too. Pepper spray isn’t just for women walking around at night, like many of us assume. It’s a good idea for anyone to keep a canister in your home or car to arm yourself against potential threats. Whether you’ve taken a job that requires you to be out at night or you’ve moved to an unfamiliar city, if you feel at risk, it’s important to take steps to minimize that risk. Investing in pepper spray is a great way to do that. After all, peace and a sense of safety are priceless. 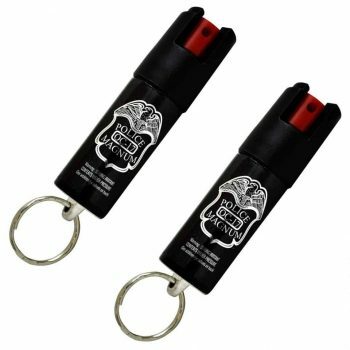 In this article we’ll talk about what to look for when deciding which pepper spray to buy and the best pepper spray available for you to purchase online. Before we dive into our review of seven pepper sprays, it’s important to know what to look for when making your decision to purchase one. Not all sprays are created equally and everyone has a different need within self-defense for their pepper spray. What’s Legal in Your State? The size and weight of the canister. The type and amount of ingredients. For example, in Alaska you must be 18 years old to buy pepper spray and in California you cannot purchase pepper spray that is more than 2.5 ounces. In Illinois, you aren’t permitted to carry pepper spray in Chicago at all. Before purchasing, make sure you check out your state’s restrictions. There are three different types of pepper sprays as well, knowing each type will help you choose the one that’s right for you. A stream sprays like a water gun. It sprays at 10 ft distance so you don’t need to be close to your attacker. It is also liquid based, which reduces the chance of wind blowing it back on you. On the other side, it will require accurate aim to hit the attacker in the eyes. It’s not useful against multiple attackers because you need to have specific aim. It sprays like a hairspray, so it’s a bit more focused and concentrated than a stream spray. It does not require great aim and covers a wide area. Lingers in air after you spray it. If the attacker runs into it, it would affect them. However, it can blow back on you if there is a wind. Sprays at an 8 ft distance, which is shorter than a stream spray. Sprays out thick, like shaving cream. The condensed quality makes for an easy clean up. It would cover an attacker’s face and be able to stick to glasses. It’s also opaque, so even if it took a minute to penetrate around glasses to get to eyes, it would obscure vision. On the other hand, it sprays at the shortest distance of all three types, 4-6 ft. There are a lot of complex names and acronyms when it comes to pepper spray ingredients and heat percentages. You want to know the heat bearing component and the strength of the formula in the pepper spray you are buying. The Oleoresin Capsicum (OC) is the oil taken near the stem of a pepper. The Major Capsaicinoids (MC) indicates the strength of the pepper spray. It measures the heat of the liquid being sprayed from your canister. The MC content is measured through lab testing, not a taste test like Scoville Heat Units (SHU). The Scoville scale is the measurement of the pungency of the peppers, which means it’s not a measurement you want to totally discount either. The MC is just more objective and accurate across different people’s tolerance. You’ll want to look for the MC percentage if you can get it. The higher the percentage the more effective the spray. Keep in mind, 3% is likely the highest you’ll be able to purchase but that will also depend on your state. The size of the spray you’ll buy is best determined by how you want to carry it. If you’re a jogger or walk a longer distance from work to your car each day, a spray you can attach to your keychain might be what you’re looking for. Lightweight, portable, and hard to forget, something under 2oz might be what you want. Around 2oz is considered a medium sized spray. It’s a good size to fit in a purse or a pocket. 4 oz or larger sprays are ideally worn in a holder on a belt or attached to a wall in a home. Do not use pepper spray designed to confront human attackers on large animals, like bears. You can use human pepper spray on dogs or other animals of that size that may be chasing you when running of cycling however. Bear spray is meant to cover a wider radius and has a lower concentration of OC. Bear spray is meant to irritate and scare off bears, not incapacitate them like pepper spray is meant to for humans. Bear spray also usually comes in one standard size which may not be appropriate for your purposes. You may want to get a spray with a safety lock. Most sprays nowadays have this feature but you should decide how important it is for you. The safety switch prevents accidental discharge either from yourself or especially from a child. If you are worried about being too nervous to unlatch a safety lock in an assault, you may want to consider going without one. Pepper sprays have a predetermined number of sprays listed on the bottle. You can keep track and weigh the canister in your hands for a good estimation. Pepper sprays will expire, mostly due to the pressurized aerosol canister not being able to spray the advertised distance with age. Check your canisters after purchasing, they are usually good for 2-4 years from the manufacturing date. We’ll now go into the seven best pepper sprays available. We’ve organized them from which are best for stationary use- such as keeping in your car or home, to best for travel use, meaning they can be carried on the person on a keychain. 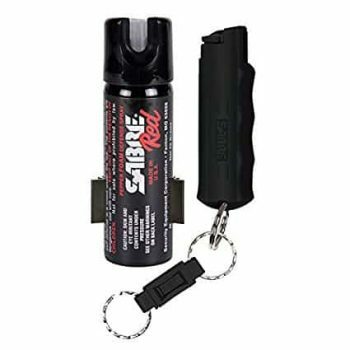 The Sabre Red Pepper Spray uses a Police strength formula and is utilized by police in New York, Chicago, Los Angeles County Sheriff’s & US. This spray is also made in USA and has a 4-year shelf life. This kit comes with two parts: Home Spray and Away Spray, providing you protection, wherever you may be and a “How to Use Video”. The Home Spray is a foam that helps to reduce indoor contamination. There is a glow in the dark safety latch as well and wall mount so you can place it wherever is most convenient for you. Because this is a foam, it is more effective the closer you (eight feet or less seems to be ideal) are to an attacker. The Away Spray uses a stream, which is designed to reduce blow back and protect the user from contamination. It comes with a key ring, making it accessible to you even if your keys are in a lock or in your car’s ignition. Key complaints on this product include less sprays than advertised and difficulty aiming. Please Note: This spray is not available to ship to Florida, Hawaii, Massachusetts, New Jersey, New York, South Carolina, Washington DC, or Wisconsin. Related: Sabre also offers a Spray Attached To A Belt Clip for added convenience. It is available for approximately $7. Defence Tech First Defense 360 Spray is immediately effective with 1.3% OC. Its stream spray ranks high among users and it does not vaporize making it a safe option for those using the product. Aside for self defense, it’s also good for hunting where you might want to ward off animals. There is a low likelihood that they would come into the receiving end of the spray as it does not linger in the air. It has a four-year shelf life warranty. It’s not meant for a key ring but to put in a purse, backpack or car. As far as pepper sprays go, it’s about as basic as you can get but it certainly gets the job done. Please Note: This spray only ships within the U.S. excluding certain states such as AR, CA, DC, FL, HI, MA, MI, NC, NJ, NV, NY, SC and WI. The Tornado Pro Extreme Pepper Spray has a trigger guard which is different than a safety lock. If you have arthritic or large fingers, or are just nervous about unlocking a safety lock in an already scary situation, this could be very valuable for you. Instead of depressing a valve, like you do with a Sabre spray, put your thumb under the spring loaded safety cover on top of the canister and press down. This spray is not a stream, it’s a cone, making it easier to use and therefore more effective for most people. Like all sprays, it’s recommended you test yours before attempting to use it in an altercation. The release mechanisms can malfunction and it’s possible that if it’s defective, a full canister will not emit any spray. A short test will not empty the canister of all its spray but it will let you know if it’s useable. Related: Tornado also offers an Armor Case you can attach to a belt clip or key ring for added protection. It is available for approximately $9. 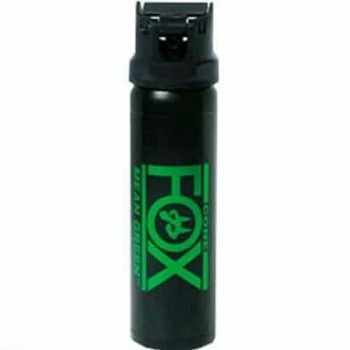 Fox Labs Mean Green Pepper Spray is a green, water-based defense spray formula. It’s made from organic pepper resin rated at 3,000,000 Scoville Heat Units. This resin is so purified it is virtually clear which is where the added green comes in. When sprayed, the attacker will be covered in not only an uncomfortable level of pepper spray but sticky green dye that will give away their attempted attack if they managed to run away. The twist cap makes it difficult to accidentally spray yourself which is a plus. Three ounces means it’s much too large for a keychain, buyer be warned. It’s also pretty large for a purse too. The best use for this spray would be in your car, backpack, or home. A note on expiration: Fox goes by a two year expiration, which is less than some other company’s sprays. The sprays can work up to four years but two is the height of its potency and therefore effectiveness. Related: Fox Labs also offers a Pistol Grip Stream Pepper Spray for heavy duty use. It is available for approximately $47. 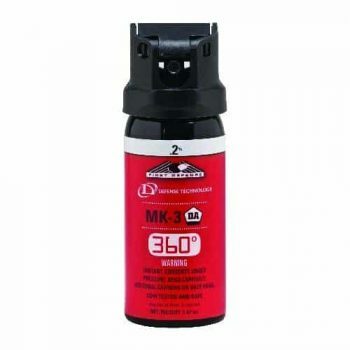 The Police Magnum Pepper Spray is one of the most highly concentrated pepper sprays allowed by law and is the same spray used by many police officers. This pepper spray also has a 15ft radius as well. It’s easy to fit in the cellphone pocket of a purse. It contains a unique orange dye to help identify attackers. After being sprayed, an attacker will experience burning skin, eye irritation and watering, coughing, runny nose, and breathing difficulties but will not experience any permanent injuries. One of the downsides to consider is its safety lock. It is a twist lock on the top of the canister that can become untwisted if not carefully stored. It’s also necessary that you check the expiration date, especially when ordering online as it may not always expire three years into the future. Since this is a spray, it also runs the risk of having a defective trigger and the stream may dribble onto your hands. It’s recommended by the manufacturer to do a spray test for this reason. This spray is best used once. 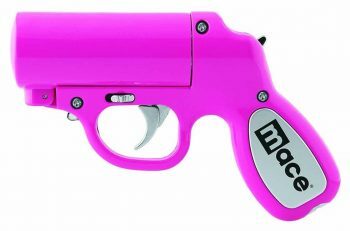 This Mace Brand Pepper Spray Gun may look cute and harmless but it packs a punch. Symptoms aren’t permanent but include: intense eye pain, tearing, running nose, and incapacitation for about ten minutes. In total, you can expect your attacker to be very uncomfortable for about two hours. The spray gun has the longest distance range we’ve covered, a whopping 20 ft. It also comes with a water cartridge so you can test this out for yourself without wasting any spray. Many users find the “gun format” easy to use with helped with accuracy as well. The LED light activates with the spray, disorienting an attacker’s vision and also helps you to accurately aim in low light situations. There is one potential issue here though, and a serious one. It looks like a gun and you want to make sure your attacker doesn’t have a real gun and is willing to use it against your “gun”. Related: Mace Brand’s Pepper Spray Nylon Holster is also available to hold this pepper spray gun when it is not in use. Specific features: Easily clips to keys, purse, backpack or leash, has a stylish studded handle, replaceable 1/2 oz. pepper spray insert (included), dye to mark attacker, 10-12ft range. 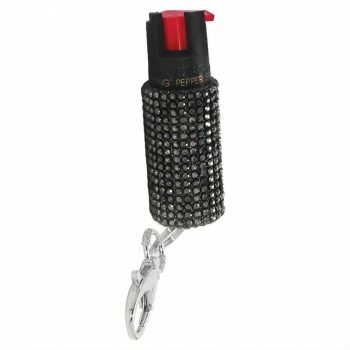 The Blingsting Pepper Spray was born out of the need for women to be safe and the desire for that safety to be easily accessible and fashionable. The Blingsting moves with you. It is easily attached to your keys, purse, backpack, or a leash for protection at all times. It doesn’t sacrifice strength for style however. The strength of this pepper spray is nothing to discredit. Plus, there’s dye in the spray to aid in identifying attackers. It’s also easy replaceable whereas most sprays you have to buy a second one after using the first. There is a safety position that prevents accidental discharge- just twist the cap counterclockwise to unlock. There is also a visible expiration date for you to take note of. There is no permanent damage to the user or attacker when properly used. Unlike some pepper sprays, this one is legal for use in all 50 states. Related: Blingsting also makes Cute Handheld Alarms that clip onto keychains and alert others when you are in danger. They are available in several colors and styles for approximately $20. We’ve covered a lot in this article. From acronyms and formulas to types to spray and products. A little bit of everything you need to know to understand the language around pepper spray products and to have a deeper understanding of both what your personal defense needs are and what products will be best suited for them. For your home or car, a foam canister around 4oz might be a good choice. If you’re a runner or cyclist, a stream or cone spray lighter than 2oz would be just right. Let us know what you’re thinking in the comments below. Have you used any of these products before? What are your favorites? Best Solar Phone Charger: Which Is Your Best Option for Emergency Situations?